More than 200 pupils from School Complex Nº 59 took part in the presentation of the ADAMED SmartUP programme, which took place on 5th April 2017 in the school building at ul. Sobieskiego 68 in Warsaw. The event participants learned about the programme’s aims and the advantages of taking part. The ADAMED SmartUP programme appears everywhere, where physical and natural sciences can be promoted. 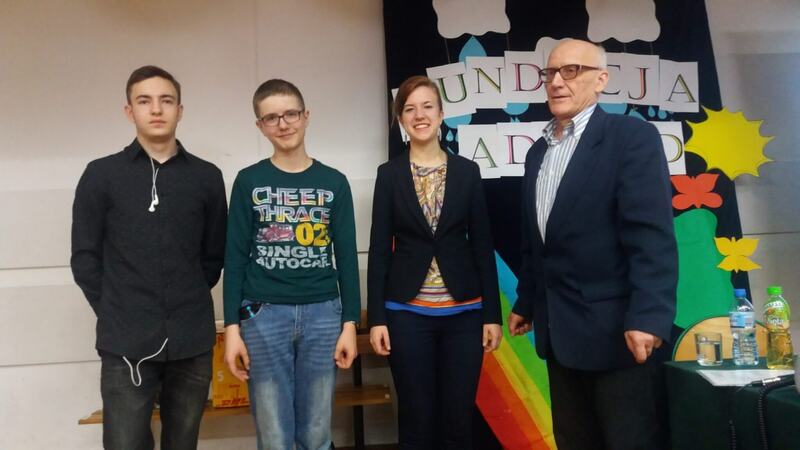 On 5th April 2017 it was at School Complex Nº 59, for a meeting with high school and mid-school pupils. More than two hundred pupils, who attended the event, solved science puzzles on the ADAMED SmartUP platform and seemed to be very interested in scientific studies. ADAMED SmartUP gadgets were also very popular among the pupils. The highlight of the meeting was the presentation of the ADAMED SmartUP project. The pupils learned that it is a nationally unique scientific and educational project, which promotes exact and natural sciences. The programme takes many forms – from an on-line platform with materials showing the interesting side of science, a series of free weekend workshops, to a scholarship programme for gifted teenagers. The participants were also intrigued by the fact that the first stage of the programme is open to everyone and all applicants have equal chances. This is why, up until now, more than 15,000 pupils from all over Poland have taken in the previous editions of ADAMED SmartUP. After Wednesday’s meeting the number of programme participants will surely increase.